The conference, which brings together the jazz community for a series of panels, workshops and special events, will again be held at Saint Peter’s Church at 54th Street & Lexington Avenue. 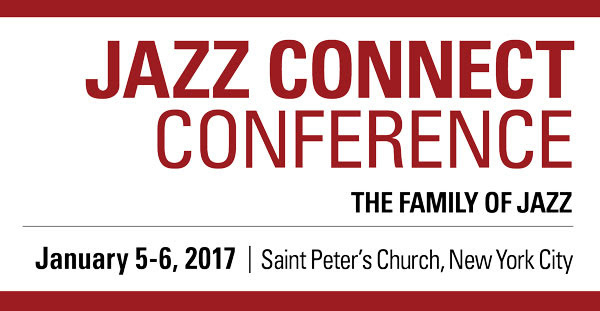 The 2017 Jazz Connect Conference, with a theme of The Family of Jazz, will again flow into both the APAP conference and Winter Jazzfest. This past year’s conference was attended by over 800 industry professionals and artists from around the world and it featured a keynote address by Dee Dee Bridgewater, recently named a NEA Jazz Master. The Grammy-award winning bandleader/composer/arranger Maria Schneider will give the keynote address at the 2017 Jazz Connect Conference. In addition, Christian McBride will receive the Bruce Lundvall Visionary Award, for his efforts in expanding the audience for jazz. Besides the robust programming, the conference also offers great networking opportunities both informal and formal, including a mixer with drinks and snacks as well as the the popular Ask the Experts session in which attendees can meet with established industry professionals to ask questions and exchange ideas in a speed-dating format.